The Green Bay Packers are the favorites, again, and should reach the NFC Championship Game. 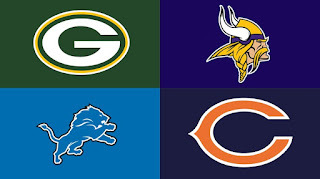 The Minnesota Vikings and the Detroit Lions should fight for a wild card spot in the NFC while the Chicago Bears will have a weekly debate on if it is time to turn the team over to Mitchell Trubisky . The Packers are 4-2 against the Vikings & Lions in their last 6 meetings. They average 36 points per game in their 5 wins against the Bears since 2014. Minnesota is just 2-4 against Detroit in the last three seasons. Those games have averaged just 34 total points. Against Chicago, Minny is 4-2. The Lions have 5 of the last 6 matchups with the Bears. Green Bay has a tough road schedule, with games in Atlanta, Dallas, Pittsburgh and Carolina. The Vikings head to Pittsburgh week 2 and have three straight road games week 12,13 & 14. Detroit heads to New York (Giants), New Orleans, Baltimore, Tampa Bay and Cincinnati this year. The Bears only back-to-back road games are in weeks 14-15. The Packers week 1 matchup with the Seahawks will be their toughest home game, outside of the division, but they also host the Bengals, Saints and Bucs. Three of their first 4 games are at Lambeau Field. Minnesota also gets three of their first four games at home and like Green Bay, will host New Orleans, Tampa Bay and Cincinnati. The Lions have a very tough home schedule, with games against the Cardinals, Falcons, Panthers and Steelers. All of those games are in the first 8 weeks of the season. Chicago get the Falcons and Steelers at home in weeks 1 & 3.